Nokia, market leader in mobile handset, has launched Nokia 7230 slider mobile with excellent looks, attractive features and stylish colours viz. pink and black. The Nokia 7230 comes within the price tag of Rs. 5999/-. 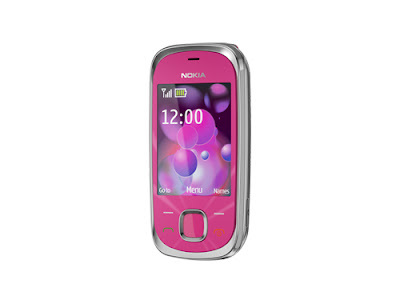 Nokia 7230 comes with premium metal job, 3.2 MP camera with 4X digital zoom, share your photos and videos with easy upload in Flickr, Vox, YouTube, Facebook, or share via Bluetooth, instant messaging, E-Mail and social networking like twitter and facebook, Nokia life tools and also Ovi services. Internal storage capacity is 70MB and memory can be expanded upto 16GB, music lovers can find built-in 3.5mm headphone connector, music player and Nokia Music Manager in the Nokia 7230.